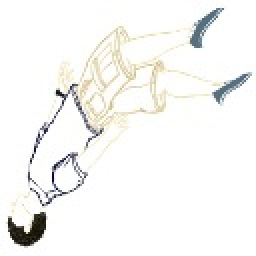 - Additional Knowledge: Momentum generation and turns attacks face down. 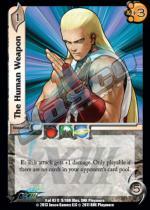 Creates insane combos with Hurricane Upper and Haoh Shikou Ken. Creates an Infinite Combo with Infinite Weapons and Hurricane Upper. - Infinite Weapons: Kill condition Number 2. Infinite Combo possible with Hurricane Upper and Additional Knowledge. 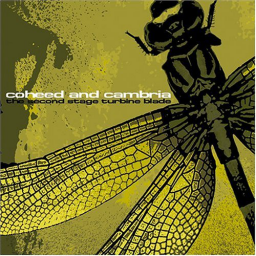 - When the Moon Comes Over the Mountain...: 4th attack and the attack searcher. Makes Zoey attack when she isn't supposed to due to her F, making some interesting interactions with Hurricane Upper + Additional Knowledge. - Nailed It!!! : Readies a lot of the defensive and offensive tools of the deck if opponent gets greedy, so it works to keep them in check. The form helps keep some assets/foundations in check during kill turns. Has both Air and Earth, and is also a target for Haoh Shikou Ken. 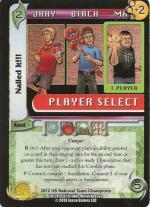 - Zealot Rush: Card draw. Needed a n extra target for Haoh Shikou Ken in case of emergencies. Readies myself after hit by a Moon. - Haoh Shikou Ken: The card Zoey was always dreaming of having. A Powerful Ranged that triggers United We Stand yet combos to Sure You Can!. Will (almost) ALWAYS deal damage. The United We Stand enabler. Can become a last push with United We Stand and/or Vengeful Intentions. Creates interesting combos with Seal of Retribution. - Hurricane Upper: Multiple Ranged, which combos well with Additional knowledge for hilarious recursion and Haoh Shikou Ken + Seal of Retribution. Helps recur cards due to its First E. Turns beyond stupid with United We Stand. Infinite combo with Infinite Weapons and Additional Knowledge. - Sure You Can! : Selective card draw when played correctly. Late game becomes fatal. Becomes stupid after United We Stand. 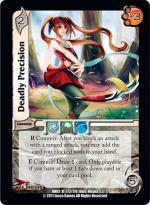 - Deadly Precision: Card draw and block recursion. Reusable with Nailed It!!!. - Familiar Faces: Self explanatory. First E reusable with Nailed it!!! in very rare occasions. - Know Your Objective: Kill turn enabler. Defensive card at times. Has block. 5 check. Spam foundation. Reusable with Nailed It. - Paid to Protect: Considering I am recurring all my attacks performed per turn, Paid to Protect becomes an extremely defensive card. Reusable with Nailed It!!!. - Seal of Retribution: Defensive and offensive. 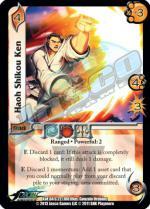 Can make fun shennanigans with Haoh Shikou Ken. Reusable with Nailed It!!!. - The Human Weapon: Spam foundation with a block. - The Hungry Wolf: Spam foundation with a block. - Prototype: Using Additional Knowledge, it can turn any attack into a kill condition: Haoh Shikou Ken into a 7M9, Hurricane Upper into a 5M9 and Sure You Can! into a 6M11 before its Combo E. Hurricane Upper can trigger this card's E without having to worry of momentum since Hurricane Upper generates it on its own. If using Additional Knowledge as momentum and Sure You Can! as the target, the cards that Sure You Can! will place in the card pool are both Prototype and Additional Knowledge, effectively recurring them both for further shenanigans. 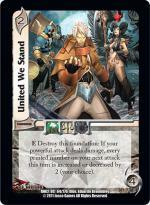 - United We Stand: Star of the deck. Turns Hurricane Upper and Sure You Can! into UR material cards. - Vengeful Intentions: Technically increases Haoh Shikou Ken's damage by 2 and can push through needed damage to kill. When in desperation, kill turns become easier to pull off. Contains a Keyword for Paid to Protect. Reusable with Nailed It!!!. This deck can only exist thanks to Zoey's F being playable more than once per turn. - Cataclysmic Force: Pure control card and can take care if problematic cards. - Spinning Necro Driver: Multiple that perform Additional Knowledge shenanigan. Destroys assets with a free E.
I like the idea of Haoh Shikou Ken and United We Stand, and Infinite Weapons with Zoey is good in general. I'm not seeing the "infinite combo" though. 1. have an additional knowledge in momentum by playing it or using Hurricane Upper's First E.
2. Play Additional Knowledge on Hurricane Upper. 3. Play Infinite Weapons on Hurricane Upper. 4. Multiple 2 the Hurricane Upper using the 2 Additional Knowledge in momentum. 6. Play Additional Knowledge on Infinite Weapons. 8. Additional Knowledge on Hurricane Upper. 9. Infinite Weapons again the Hurricane Upper. Rinse and Repeat. If your opponent cannot cancel the Forms or the Multiple from Hurricane Upper, its checking 4s until your opponent dies. I see, I see. Wasn't taking into account that Weapons lets you look at ALL the facedown in your pool for some reason. I really like this, will have to try it at my local stuff asap.